Night, right up front about Tile #71 that you have just completed, I have just seven starting words to say about it: what a MASTERFULLY compelling piece of work!!! And I just love the three guys who are watching over from the top of the bridge that is covered in snow, their facial expressions and poses an outstanding treat that is just an absolute damn pleasure to watch, let’s get that right in such a splendidly good way indeed, considering how quite phenomenal a job you did in creating the characters yourself in this tile alone!!! ;) And I even hugely appreciate the overall way you took the wonderful, wonderful time to create this entire tile indeed from start to finish, and even the way you detailed in the snow and rocks is just absolutely brilliant, too!!! Overall, I am rather most amazingly proud of you on a stunningly plain magnificent job you did on that pixel-art tile that shall successfully slot in rather beautifully with my Tile #64 indeed. Congratulations to you on your absolute top-tier creation here, Night!!! !!! Added some bones. Hopefully that counts as interesting. Focal points are generally something I struggle with. I would consider this done for now. As always though C+C welcome. Great tiles guys! That's turning into a really beautiful and thematically consistent area! @Minord: I don't want to go overboard with my critique, if you feel you're done with the tile by all means move on. There are however areas that are still very hard to read because you're not separating objects of importance from the background. Things like the tip of the spear, the tusk, and knife and hem of the pants are all white and will all read as just snow at a glance. Just indicating that they're important with some outlines will go a long way. You can also think about what background you're placing them on. The yellow flowers need never be close to skin. The weapons and white details on the clothes could always be on green. Hello to you, Esven, and what a wonderful job you did on your tile here so far, especially on the super-viscous, moist, gummiest, creamy tar part... and the way you actually colored the sticky tar bubbles green is such an *interesting* stylistic choice, and it most surprisingly quite works here, so truly well done on that as well!!! Hello to you, Esven, and what a wonderful job you did on your tile here so far, especially on the super-viscous, moist, gummiest, creamy tar part... and the way you actually colored the tar bubbles green is such an *interesting* stylistic choice, and it most surprisingly quite works here, so truly well done on that as well!!! My original thinking was that the gas bubbles would displace the surface as they rose to the top and so would kind of spill out a mound of tar around them after breaking the surface. While the bones would just be sinking. I've made the changes though and it does feel a little more consistent with the rest of the tile. What a splendid, splendid way of putting it about the bubbles there, and there is absolutely nothing wrong with the way you think regarding the tar itself. And I am so richly impressed with the way that you just now successfully implemented the thick ripples around the bones and skull; that tile of yours looks just SO much better indeed now. As excellent as ever!!! May that tile be a most handsomely welcome addition to our current 2018 ISO collab map... and such a great job from you again, Esven; I am truly proud of you as well!!! !! Finished I think. Gonna hold off on another tile for a bit til' I get a good idea. Also Eggy if you have worked a lot on your tile since you last posted just let me know and I'll adapt my edge! Amazing job everyone. I mean each collab we go forward but this time we are nailing it. Jeremy I know you aren' t done yet but your tile looks (beautifully) finished and I was going to put it in the image, but the colors are off. Well looks like I came up with an idea. 29 please! Hey mate, 49 is your own neighbor, can you pease pick another? Claiming 12. Dino attack inc. Thanks Geci, think I've fixed the colours. Great start, Geci! So far, everything looks amazing. Hey guys just a little notice: I've gotten a bit busy with other things so I haven't worked on my tile much. I'll try to make some progress this week after a finals exam that's due tomorrow. I'll likely call it done unless anyone has feedback. TRULY SUCH A GREAT JOB again, Esven, and it is rather certainly a much better tile of yours indeed (especially with the fantastic depth and detail you gave on the rest of that bridge’s snowy rock textures and even on its cave opening as well to give it that phenomenal 3d look, also!!! )... you most definitely are improving in your pixel-art skills with flying colors right here, and it clearly shows!!! !! Thanks I suppose. This tile has a more interesting composition over all but technically speaking I found the last tile in many ways more challenging. Just because I had two neighbors to tie together thematically and a tile in the center of a tar pit is generally pretty flat which can be somewhat limiting. 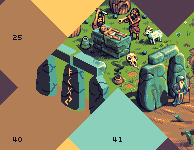 As well the goddess statue in the tar pit isn't quite isometric which I personally struggled with a little bit. Even though it's a pretty simple composition it actually took me a decent amount of time. This tile on the other hand with only one direct neighbor gave me a lot more freedom and lended itself well to having a bit more going on. Thank you for the compliment either way though. In any event I did a bit of fiddling which probably isn't even noticeable but is a little bit cleaner. Wonderful work everyone, I especially enjoy Reo, Gecimen and Jeremy's tiles! Everything is really starting to fit together now. I'd like to take 49. @Esven; your tile quality goes up very fast! Keep up the good work! @Esven: Great tile, but beware the banding on the leg! Final update to tile 58, I promise. How are you making so many great tiles so fast? Amazing work! This collab is going so fast I can't stop and appreciate all the tiles. I am absolutely and most completely glad to hear that from you, Gecimen, and so personally am I. And man, we are all quite undeniably thriving in such positive, positive creativity like there in no tomorrow, which is rather an especially good thing indeed in the case of your ever-phenomenal 2018 ISO collab project for us here at PixelJoint!!! I totally agree. !! Speaking of which, my man, I simply found your newly-claimed Tile #45 to be your ABSOLUTE overall best work of this project so far, as it quite magnificently shows a rather brilliant native primal dance between a woman and man in such deep and powerful worship together of the Moai statues most harmoniously... a perfect natural fit in such ever-wondrous and untamed prehistoria, done spectacularly in pixel-art form by you... what an utterly amazing piece of work, especially on the colors and detail (including on the statues and those two main dancers there, too!!!). I TRULY LOVED IT!!! !! And also, Gecimen, going back to my own two tiles just now — Tile #50 and Tile #64 — sometimes, even the slightest little small pixels can make a whole world of difference. That is what I just found out as I checked closely at them, and found out all of a sudden here that there was quite something amiss that I first did not even know about at all. So, for my final update of those two tiles, I had to clean up some pixels and improve on certain elements to them both. Could you please update my two tiles into our current 2018 ISO collab map? Thank you ever so much in advance for your amazing support, and a most SPECTACULAR job once again on your newly-claimed Tile #45, especially!! Congratulations to you again!!! !!! Will update your tiles in the next upload (which will probably be today). Are diagonal tiles considered "neighbored" for the purposes of reservation? For example could I reserve #11 even though it has no direct neighbors? Thanks for clarification Gecimen, sure I can handle this. Today finally I will have some free time so I plan to draw maybe 2 more pieces (when I finish this with 18 and 52 would be cool). Hello to you as well, Irenaart, and about your just-completed Tile #22, I am glad you took the time to finally create that because you did such an all-around wonderful job on it, and excellent detailing work especially on that spotted large prehistoric cat and on the bridge that the creature is crossing with sheer ease as well. Your hard work truly paid off, let me quite tell you!!! Thank you once more for letting me know, Gecimen, and you are quite splendidly welcome once again!! ;) You have yourself a great upcoming weekend!!! 18 is reserved by Eggy! And yeah diagonal tiles count as neighbors! @Esven; Sure! #18 is yours! EDIT: Ups, no it isn't. Choose some other tile. Space around Gyhoket's tile #89 is empty. Would you like some of them? Ah my bad I should have read more carefully. I thought that 18 was just a tile they were considering. 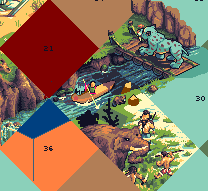 Good news is I think I can work my WIP into one of the other tiles. I'll take #11 then. @Eggy if you want to post or send me your WIP so we can keep things consistent between tiles that would be nice. It looks like you've been working on 18 for a while and I don't want to just completely upend your tile. Still a fair bit away on this. But posting a wip. 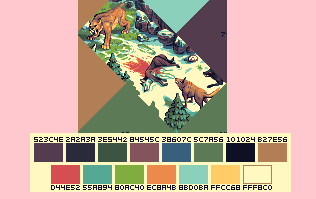 I'll probably hold off on reserving a tile until tomorrow just because I probably won't have time to finish it today.